In 2017 Wagner Valley Brewing Co turned 20! Established in 1997, Wagner Valley Brewing Co was one of the first craft breweries in the Finger Lakes. 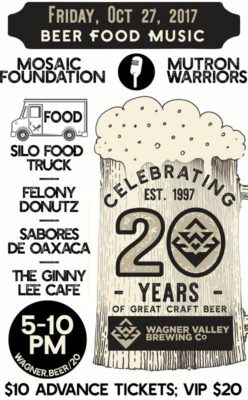 On Friday, October 27th, 2017, we had a celebration at the brewery featuring popular local food trucks and 2 well-known bands from nearby Ithaca. We had a special anniversary double IPA, Mosaic Worriors (a name inspired by the bands that played), that was a big hit! Before the big event, we had a VIP experience that sold out. Our VIPs had the chance to hang out with the brewer over some perfectly paired snacks and craft beer samples. It was a chilly night, but the heaters on the deck and the dancing helped keep everyone warm. We would like to thank everyone that came out to help us celebrate this milestone – it was a memorable night! Cheers to the next 20 years with the best craft beer fans out there! If you have any difficulty accessing information on this website, please call the brewery at 1-866-924-6378.